Facebook in China: Zuckerberg’s overdue friend request for China. Facebook might (still) need India. But what about China? Seven years since the banning of Facebook in China, Zuckerberg is still hung up on China. This week he has astonished millions of Facebook users with a video where he flaunts his Mandarin skills greeting people on the Lunar New Year. It is hardly a surprise why he has been working hard on brushing up his Mandarin, despite that his Facebook video didn’t reach the home to an estimated 1.35 billion of Mandarin-speakers. With the total of more than 667 million internet users (the number keeps rising), China is a critical market to complete Zuckerberg’s ambitious mission to “connect the world”. Note the fact that its ads accounted for more than 95% of Facebook’s total revenue in September, China can’t simply be ignored. As for the CEO of the largest social networking firm, he has both professionally and personally showed his enthusiasms to connect with Chinese audience. But Facebook is not completely dead in China (or mainland China). Many users are finding ways to break the China’s great firewall. And the recent news gives those more hope as Facebook’s app is attempting to surpass the censor. The issue could be much simpler. The odd yet significant one-minute-long conversation between Zuckerberg and the Chinese president Xi Jinping revealed a slightly different story. At the end of the day, Facebook might not need to try so relentlessly hard to win the heart of Chinese bureaucrats. Simply put, there is a way to make China respond to Facebook’s friend request: to play strictly by the local rules. 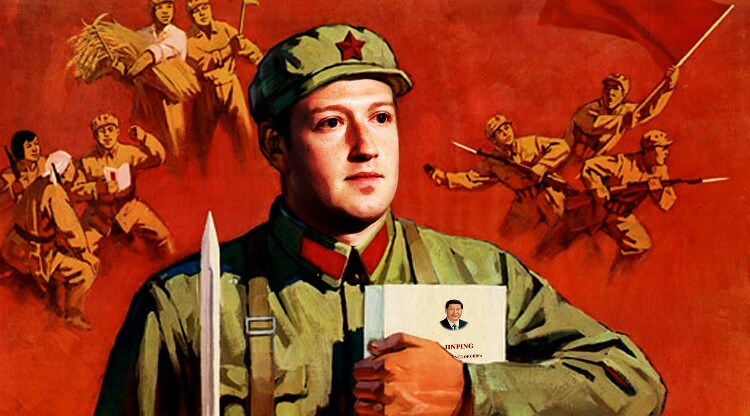 Facebook can simply make its second debut by abiding China’s code of conduct, allowing the government to step in when required. Just like LinkedIn and Evernote, Facebook could also censor and block politically-sensitive content on its Chinese site and at the same time store local data in China. LinkedIn, as a result, has about 10 million users in mainland China since 2014. But does China need Facebook in the first place? But what can Facebook offer to the Chinese mobile users? Even if Zuckerberg is happy to comply with China’s regime’s restrictions, some are sceptical of the value Facebook can add to Chinese users. Bloomberg pointed out several reasons why Facebook wouldn’t be the first choice for Chinese audience. To start with, Facebook’s framework fails to give what Chinese audience want, such as anonymity in public forums. It will also face stiff competition, as Bloomberg predicted. Currently Facebook’s WhatsApp, which is accessible in China, is only appealing to very few number of internet users. Now have a look at WeChat’s rich features – easy online payments, walkie talkie etc, many of which Facebook cannot provide. (yet). Facebook admits that its platform has a lot to catch up. So what part of Facebook would appeal to Chinese users? One thing would be Facebook’s global reach that would particularly attract those elite Chinese citizens who have friends and families beyond China. But many see the real competitive advantage of Facebook lies in its uncensored content. Unlike LinkedIn whose core purpose is to connect professionals and employers, Facebook has little to offer if freedom of speech were to be snatched away. And does Facebook really needs China? While the market size makes a sufficient incentive for Zuckerberg, they don’t tell you about the future. Many technology firms which were lured to the People’s Republic have experienced serious repercussions from China’s recent slump. From Amazon’s stock to Apple’s revenues, nowhere will the impact of economic changes be felt more than in China. Tim Cook warned that “We began to see some signs of economic softness in Greater China earlier this month, most notably in Hong Kong,” according to the Vanity Fair. In that sense, Zuckerberg can relax and simply observe the current situation, reflecting on his own strategy to re-enter China. And one day he might even find that he didn’t had to try so hard.